RME’s ADI-2 Pro and ADI-2 DAC impressed us a great deal — and now, RME have come up with a more affordable variation on the same theme. Their new ADI-2FS, which has just been announced, boasts the same great A-D/D-A conversion and RME’s lauded SteadyClock ultra-low-jitter clocking technology, but it drops a few features that some users won’t need. For example, there’s no screen or on-board menus to deal with, and all controllable features are directly accessible from the front panel. Not only does this enable RME to push the price down, but it also makes it simpler to operate for those users who don’t need to access all that functionality. 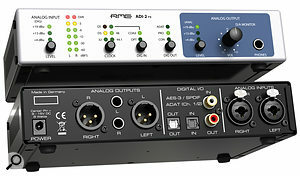 The RME ADI-2 FS is due to ship December 2018, and will be priced at £609 including VAT$999$999.